5 Bedroom Detached House For Sale in Wiltshire for Guide Price £425,000. In need of updating and modernising The Green Vine offers tremendous scope to refurbish to ones own taste. 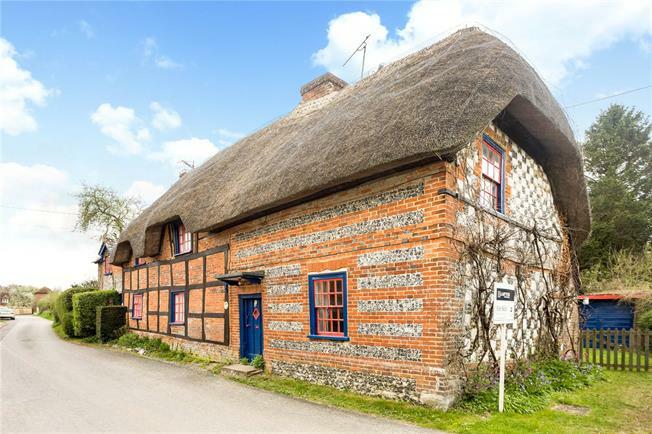 The property is situated in the village of Fittleton and surrounded by beautiful countryside and offers a fantastic opportunity to acquire a charming detached Grade II listed thatched cottage. The house is full of history with parts believed to date back to the 16th and 17th century. It offers plenty of versatile accommodation with an annexe, attractive garden extending to 0.29 of an acre in all, also parking and a garage. Originally two cottages the accommodation comprises four reception rooms, a kitchen with access to the garden, five bedrooms and two bathrooms, with the annexe being suitable for either extended family use or as a source of income. The house enjoys many period features including fireplaces, wood panelling, exposed beams and stone floors, with the dining room having a wood burning stove set in a wonderful brick fire surround. The two cottages open through on the first floor, and they both benefit from independent access as required. Fittleton is a small village situated on the east bank of the River Avon and is around half a mile from the larger village of Netheravon. Netheravon has several local amenities including a village shop and Post Office, a church and primary school. More extensive amenities can be found in the nearby market towns of Marlborough and Devizes, with Salisbury also offering shopping, theatre, cinema and an historic cathedral. The A303 is about 5 miles to the south linking to the M3 and the South West. Mainline stations can be found in Grately and Salisbury (London Waterloo) and Pewsey (London Paddington). There are excellent local schools in the area including Marlborough College, Dauntsey’s, Godolphin, St. Francis Prep, Chaffyn Grove, Leadon Hall and Farleigh. The Neolithic English Heritage site of Stonehenge is about 7 miles away, with plenty of walking, cycling, fishing, golfing available. The attractive rear garden extends to 0.29 of an acre in all; it is laid mainly to lawn and has a good degree of privacy. There are well stocked borders, many mature trees and shrubs and a lovely ornamental pond. Parking is to the right side of the house and leads to a detached garage.